Avril 2017 le Trait d’Union le plus récent a été reçu par les Sorignois. 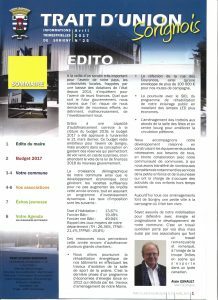 Comme toujours beaucoup d’infos concernant le budget, la commune, les associations – notamment le Jumelage de Sorigny avec Box, la pêche, les jeunes et les élections présidentielles et législatives. April 2017 the most recent link from the Borough has been received by the citizens. As always there is a lot of information concerning the budget, the community, the Associations – notably the Twinning of Sorigny with Box, fishing, things for the young and the elections for President and Parliament. Cliquez sur l’image ci-dessous pour l’agrandir. Click the image below to enlarge. 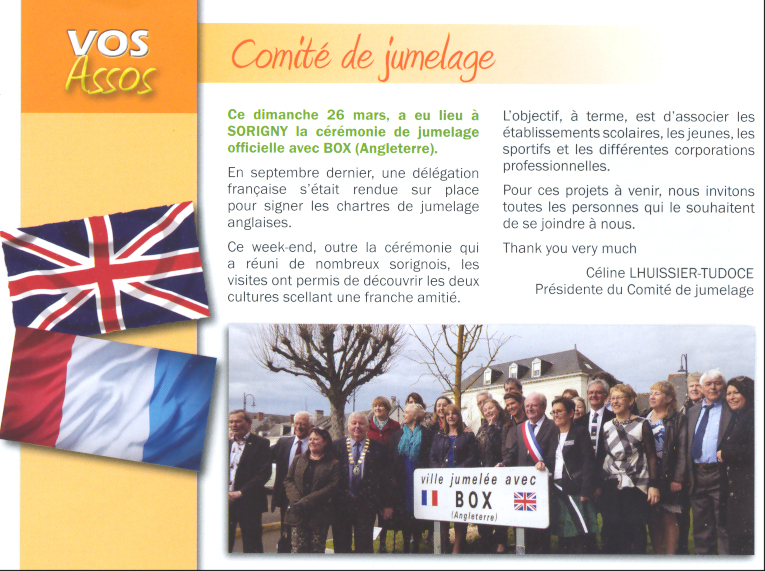 This Sunday 26 March, held the SORIGNY official Twinning Ceremony with Box (England). 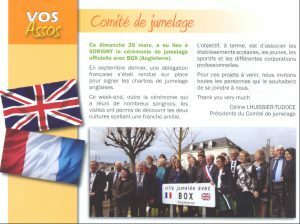 Last September, a French delegation had visited Box to sign the English twinning Charters. This weekend, in addition to the ceremony which was attended by many Sorignois, visits have enabled the two cultures to discover and seal a clear friendship. The objective, in the long term, is to involve the schools, the young, the sportsmen and the various professional organisations. For these projects to come, we invite all people who wish to join us. 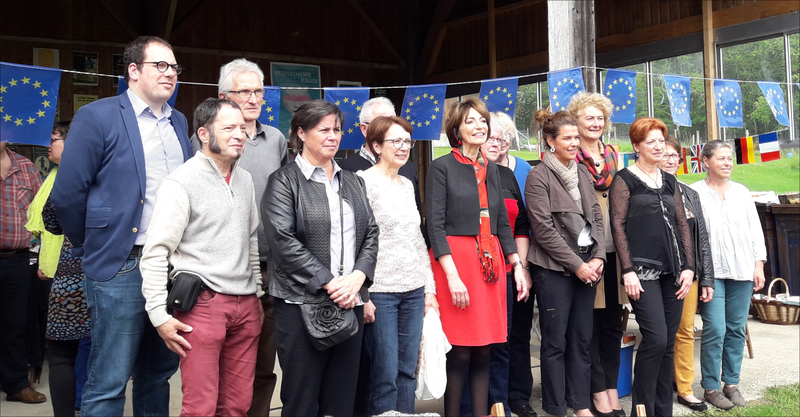 Première rencontre festive des Jumelages de la Communauté de Communes Touraine Val de l’Indre. 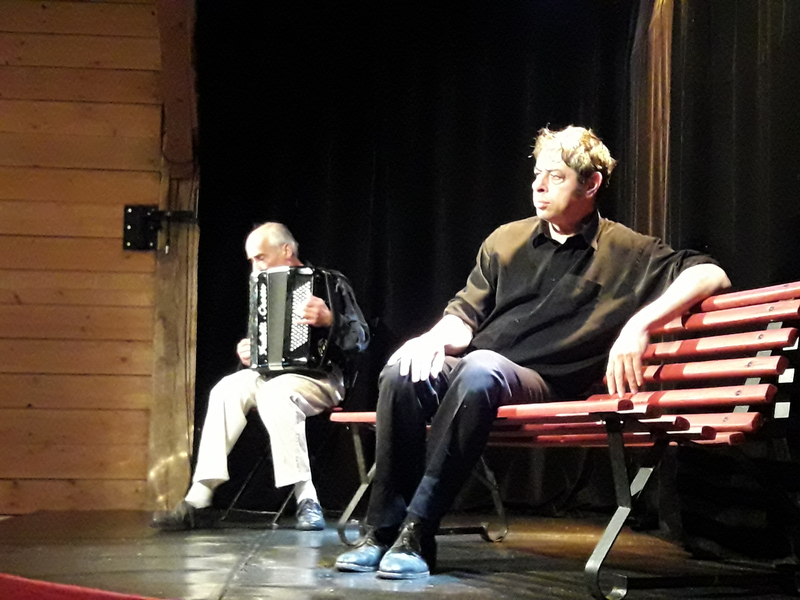 Les Comités de Jumelage (CDJ) de Azay le Rideau, Artannes, Bréhémont, Esvres, Montbazon, Monts, Saint Branchs, Sorigny, Truyes se sont rencontrés à la Grange Théâtre, Vaugarni, Pont de Ruan. Ils ont discuté des jumelages dans les villages en Angleterre, La Pologne, Le Chypre, L’Italie et même la France. The Twinning Committees of Azay le Rideau, Artannes, Bréhémont, Esvres, Montbazon, Monts, Saint Branchs, Sorigny, Truyes met at the Grange Théâtre, Vaugarni, Pont de Ruan. 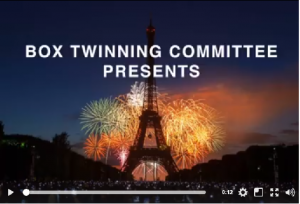 They discussed twinningin villages of England, Poland, Cyprus, Italy and even in France. 10H00 Echange d’expérience-débat des animateurs des Comités. 12H30 Buffet EUROPEEN partagé tiré du sac ouvert à tous. 15H00 SPECTACLE GRATUIT « Les Konkasseurs de Kakao ». 10.00 Exchange of experiences and issues in common of the committees. 12.30 European Buffet (bring & share). 15.00 Free show « The Coffee breakers« . 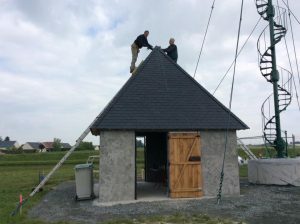 Great progress by the Sorigny Heritage Association. Stupor in the commune, Saturday when the news of the death of Gilbert Trottier and his wife Danièle is widespread in the population. Mayor for twenty-four years, from 1977 to 2001, Gilbert Trottier has marked the commune. It was appreciated by all and has left a strong imprint with the population. The victim of a road accident on the RD 910 in the direction of Chartres, with his wife, Saturday morning, he was there in the cinema Generic with his friends on Friday evening. [Note: Vous aurez besoin d’un compte chez Facebook pour le voir / You will need a Facebook account to see it].